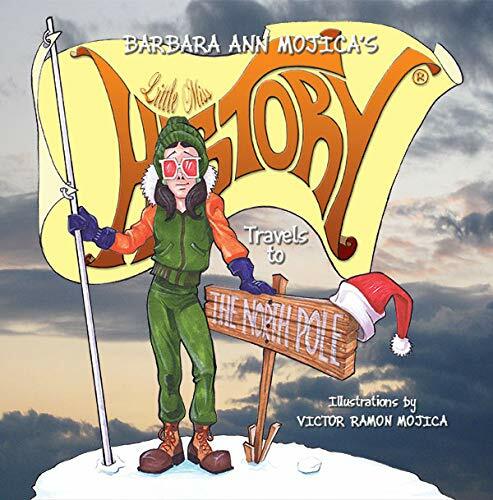 Little Miss History Travels to the North Pole by Barbara Mojica. Book Review. This is another picture book in the series by Barbara Ann Mojica where a character named Little Miss History journeys to interesting places in the United States and around the world. She doesn’t just focus on history but also explores the environment, culture, and more. In this book she shares the factual and the mythic facets of the North Pole. Children will be fascinated by some of the facts in this text. For example, unlike Antarctica the North Pole has no land mass. It also has no time Zone. There are a surprising number of living creatures in this frigid place. Kids who like to learn unusual information will enjoy this book. No one owns the North Pole. Mojica examines the history and politics in a simple and informative way. Mojica writes: “Sunrise and sunset come once a year. The North Pole receives six months of daylight and six months of darkness.” You will have to explain that this is not the same in the entire Arctic Circle. There, people experience months of Twilight where it is halfway between night and day. There is even some disagreement between scientists as to whether the North Pole has full darkness for 6 months and full light for 6 months. Of course, since this is a picture book for small children, the inevitable question of Santa Claus will come up. Mojica talks about the various Saint Nicks through history and in different cultures without damaging a child’s belief. The book ends with the one-page glossary of words such as indigenous and mammals. Another fun and informative book that would make a great gift. This book sounds amazing. In reading your review I have learned some things about Antarctica. My little buddy will enjoy this book. Thank you! I’m glad you found it interesting. I think you meant to type arctic. Thank you, Bonnie for taking the time to read and review my newest book. Jeremy, I am glad that you learned a lot from the book. That is exactly my objective!